Please contact Amy Irwin 419-209-0604 or Amy Hinesman 740-496-1311 for more information. Click HERE to view current information. 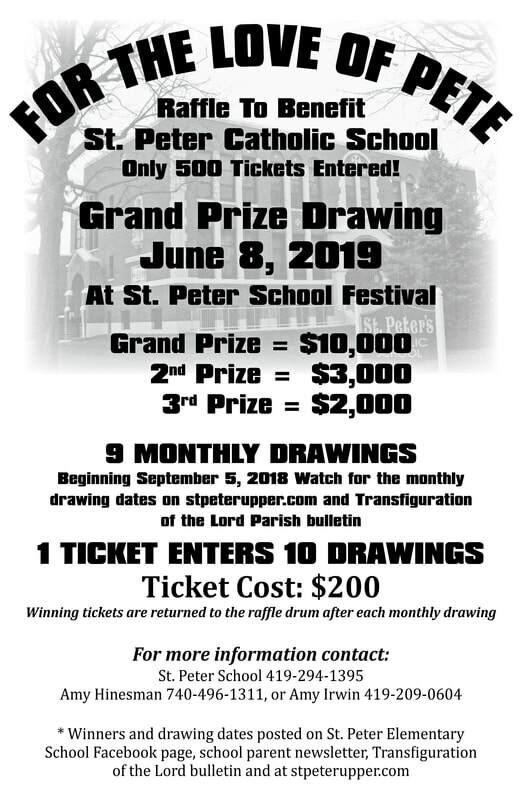 ​Thank you for supporting St. Peter School!!! St. Peter School sells Discount Cards each fall. Thank you to all businesses that participate in this program. Box Tops help schools earn cash for much needed items, from books and computers to playground equipment. Box top coupons can be found on countless grocery and household items. Collection boxes for the coupons can be found in the back of church and at school. Scrip stands for substitute money. Scrip is gift certificates from retailers sold to the school at a discount. The gift certificates can be used like cash at face value. The merchants support our school by giving St. Peter School the discount. The discount percentage given to the school is shown on the order form. Orders can be placed by turning in the an order form to the school office. Forms are always available in the back of church or chapel or at the school office. An order from is also available on this website. On line orders can be placed at Shopwithscrips.com Click Here For More Information﻿. The breakfast is sponsored by the Knight’s of Columbus #2050. Held the last Sunday of January. For more information contact Jerry Davidson at 419-306-5918. The bake sale is sponsored by the Catholic Ladies of Columbia #86. For more information contact Barb Grasz at 419-310-9715. All proceeds benefit St. Peter’s School. The pork chop barbeque, drive-thru, is held the second Sunday in November. For tickets or more information contact any K of C member or Jerry Davidson at 419-310-9715.